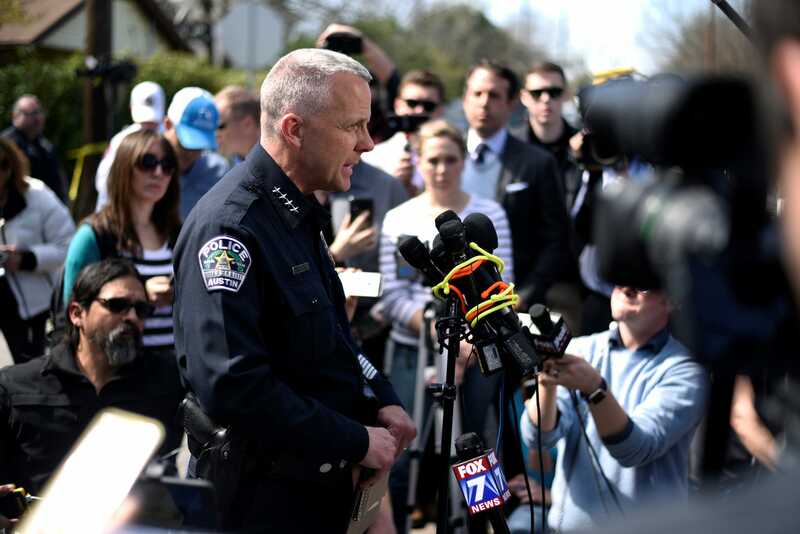 Local police officers and federal law-enforcement officials say the suspect in a string of deadly bombings in Austin, Texas, has been killed. Authorities identified the suspect, whom they believe to be responsible for all of the recent bombings, as 24-year-old Mark Anthony Conditt. President Donald Trump tweeted to congratulate law enforcement on the suspect’s death. The suspect in a string of deadly bombings in Austin, Texas, was killed early Wednesday during an encounter with law enforcement, according to the Austin Police Department. The suspect, identified as 24-year-old white man Mark Anthony Conditt, killed himself with a bomb as law-enforcement officials including FBI agents and a SWAT team approached his vehicle outside a hotel in Round Rock, just north of Austin, the police said. The police apparently identified a vehicle being used by the suspect with help from surveillance footage at a FedEx facility near San Antonio where a package bomb exploded early Tuesday morning. The police found the vehicle and followed it to a roadside hotel where the suspect detonated an explosive device, killing himself, as officers approached his car, law-enforcement officials told the press on Wednesday. One police officer was hurt while approaching the suspect’s vehicle, according to the police. “AUSTIN BOMBING SUSPECT IS DEAD. Great job by law enforcement and all concerned!” President Donald Trump tweeted in response to the news. The White House on Tuesday said it had been monitoring the investigation. The police remain unsure of a motive but believe the suspect was behind all five of the bombings that left two people dead and several others injured this month. Authorities warned that additional explosive devices could remain and that people in the area needed to remain vigilant. Sergio Flores/ReuteresAustin Police Chief Brian Manley at a March 12 news conference near the place a woman was injured in a package-bomb explosion in Austin. The bombings began March 2 when a package left on the front porch of a home overnight exploded, killing Anthony Stephan House, 39. 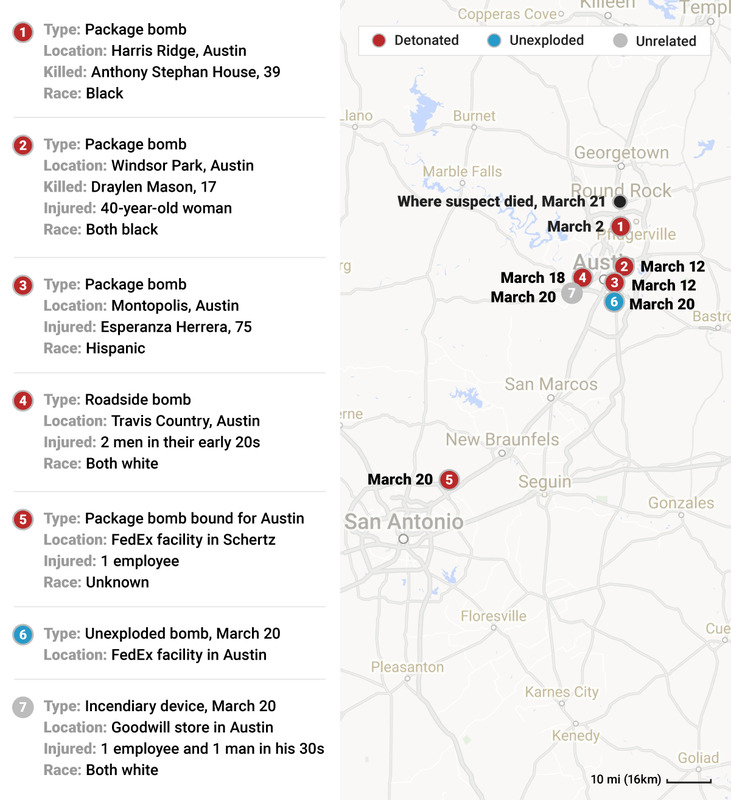 On March 12, another two package bombs exploded at homes around Austin, killing Draylen Mason, 17; injuring his 40-year-old mother; and injuring a 75-year-old woman named Esperanza Morena Herrera. 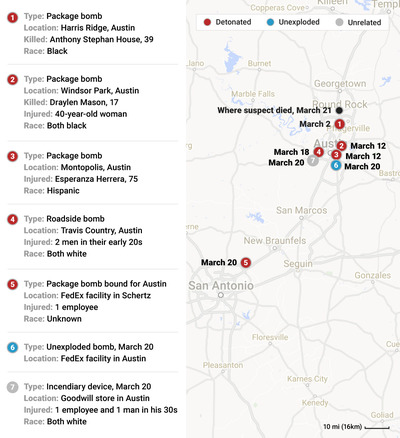 On March 15, Austin Police Chief Brian Manley told the press it was possible that the bombings may be motivated by hate because all of the victims at the time were people of colour. Three days later, however, two white males were injured by a trip-wire explosive placed on the side of the road, which Manley said showed “a higher level of sophistication” and skill than authorities initially expected from the bomber. Then, early Tuesday morning, a package exploded on a conveyor belt in a FedEx facility in Schertz, Texas, about 65 miles southwest of Austin, near San Antonio. One person was hurt but was treated at the scene. The package discovered Tuesday was believed to be the first mailed device in the string of bombings. This story is developing. Click here to read the latest version.